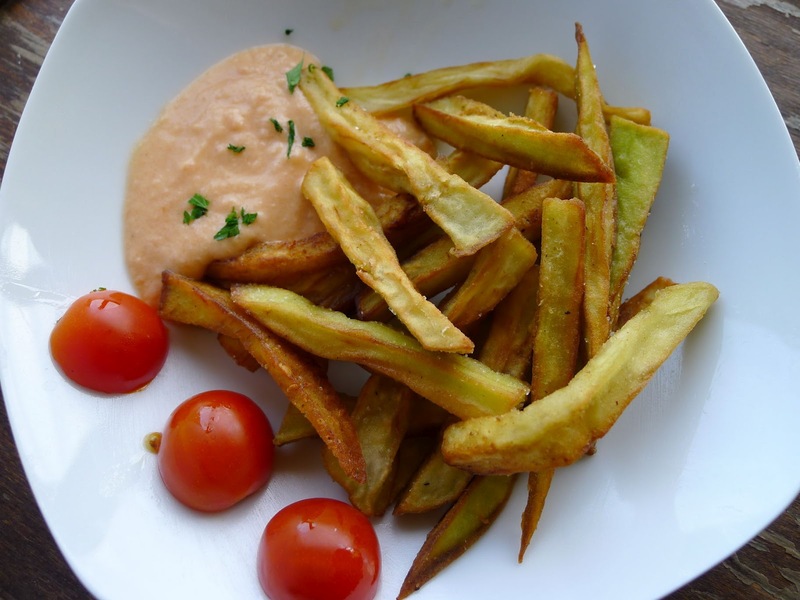 Once upon a time, there were no tomatoes in Spain. Tomatoes, of New World origin, were unknown in pre-Columbian Europe. (What ever did the Italians put on their pasta?) But there was still gazpacho, or its progenitor, a smooth cream of pounded bread and olive oil, flavored with garlic and almonds. That white gazpacho, ajo blanco, is still a summertime favorite, especially in Málaga (southern Spain), where it is a traditional dish. 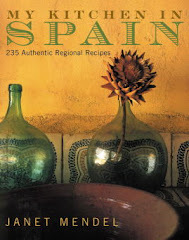 In a collection of recipes from Málaga, Papeles de Gastronomia Malagueña, the writer Enrique Mapelli recounts how making ajo blanco was a summertime ritual. 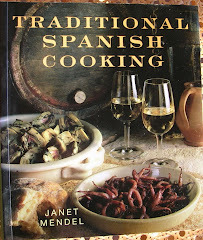 In the late afternoon, village women would sit in their doorways with the almirez, a brass mortar, pounding garlic, almonds and bread to a smooth paste. Olive oil beaten into the paste creates a thick emulsion, to be thinned with vinegar and cold water and—the final touch—sweet moscatel grapes plucked from an arbor on the patio. The basic oil and bread emulsion is the starting point for all authentic gazpacho, even the one with tomatoes. 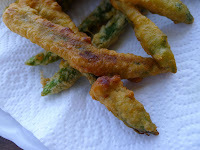 (see that recipe here). Ajo blanco literally means, “white garlic.” It’s usually made with ground almonds, garlic, bread, olive oil and vinegar and garnished with grapes. Early in the summer, it is made with “green” almonds, those still on the trees which have not yet formed hard shells. 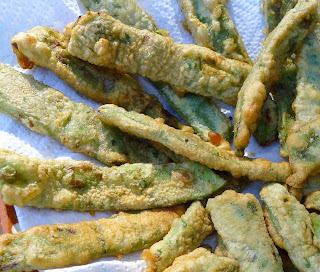 In the springtime, pounded fava beans are used in place of almonds. And in the pine forests of the marismas, wetlands, pine nuts are used in place of almonds. 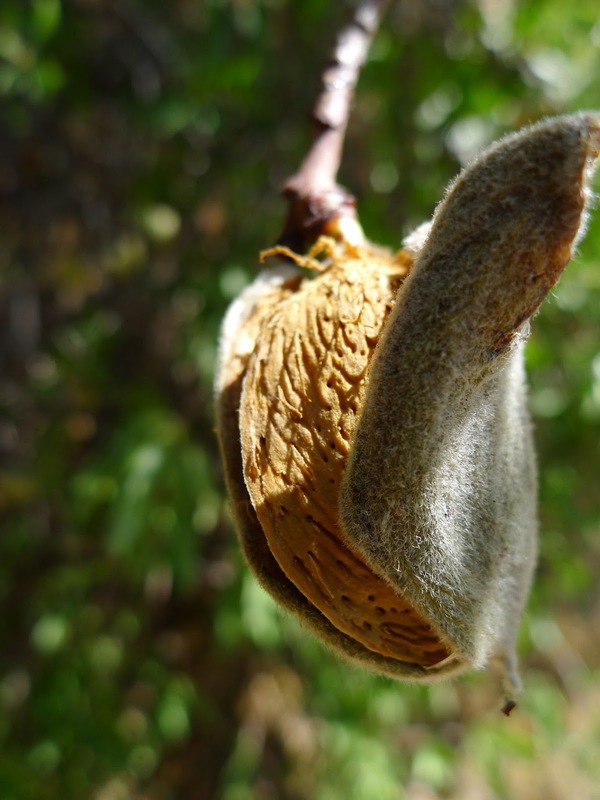 The almonds on the trees in my garden are maturing very early this year. Already the outer green husks are splitting open. 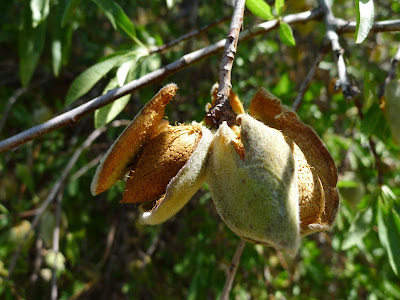 Within a few weeks, the almonds in their shells will drop to the ground. I gather them for keeping through the winter, for making cookies, thickening sauces, noshing. 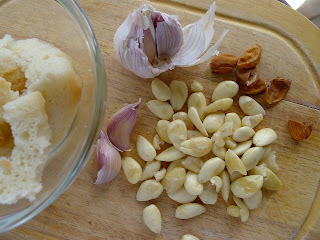 Blanched almonds, garlic and bread for ajo blanco. Right now, I’m making ajo blanco. 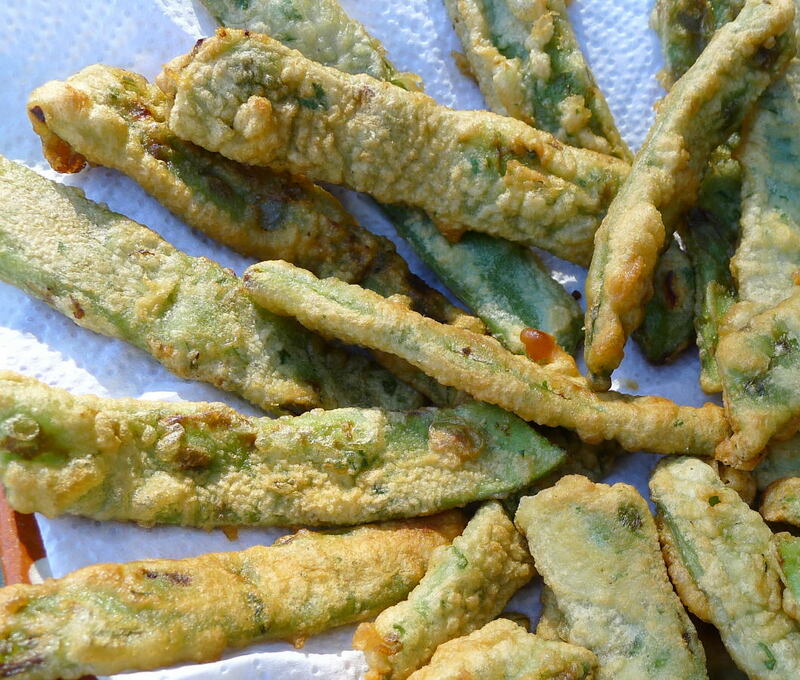 Tangy, salty, creamy, cold—it is better than the sum of its parts. The sweet grapes make a brilliant contrast of flavors. A bit exotic, ajo blanco surprises. My grandson Leo cracked the almond shells for me (a 50-centimo job). Then I plunged them in boiling water for 30 seconds. 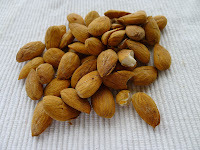 While still warm, it’s easy to slip off the outer skins of the almonds, leaving the white nuts. The traditional version of ajo blanco is made with mortar and pestle, but it’s quickly confected with a food processor or blender. For a really smooth version, the mixture can be sieved. But I rather like the graininess of almonds ground in a blender. Sweet moscatel grapes are the traditional garnish, but seedless grapes can be used instead, or substitute diced melon or apples. 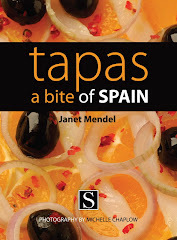 Serve ajo blanco in bowls as a starter, or in shot glasses to pass around at a party. Ajo blanco shooters, great party food. Soak the bread in water to cover until it is softened. 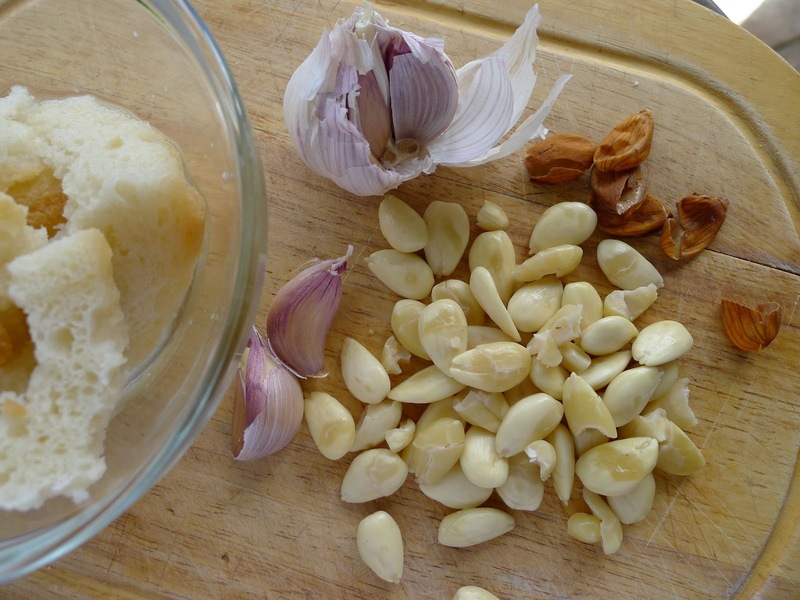 Squeeze out the water and place in food processor or blender with the almonds and garlic. Pulse until the almonds are finely ground. With the motor running, add the oil in a slow stream, then the vinegar and salt. Blend in some of the water, then pour the mixture into a pitcher and add remaining water. Chill until serving time. Stir before serving. Pour into shot glasses. Spear grapes on cocktail picks and place in each glass. 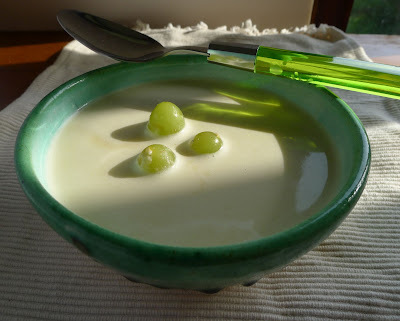 Ajo blanco con uvas, a delectable summer gazpacho. Fillets of mackerel, a good substitute for tuna. A couple weeks ago I wrote about the guilty pleasure of eating fresh bluefin tuna. I made some half-hearted promises not to buy the endangered fish again. So far, I’m honoring that pledge. This week at the fish market, alongside the slab of gleaming tuna, were large-sized mackerel, another blue fish. Weighing in at about 3 pounds, this was a meaty alternative to the forbidden. 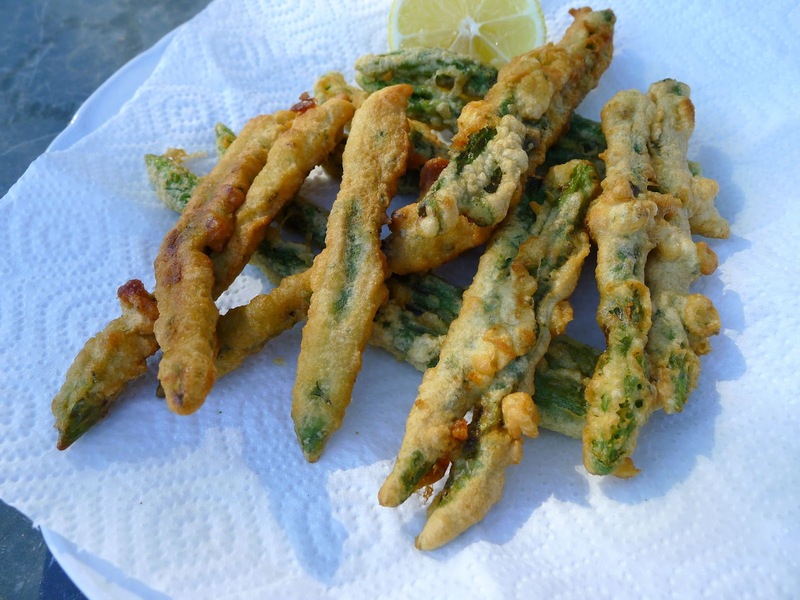 While the mackerel (caballa in Spanish) would have been delicious simply grilled, I chose a recipe I had tasted in Sanlúcar de la Barrameda, a marvelous town on the Cádiz coast, where the Guadalquivir River empties into the Atlantic. Besides superb seafood, Sanlúcar is known for good vegetables and, of course, manzanilla, its particular style of dry Sherry. Imagine a fisherman’s wife inventing this delicious dish with the remains of the day’s catch, fresh vegetables from her kitchen garden and a splash of the local manzanilla. 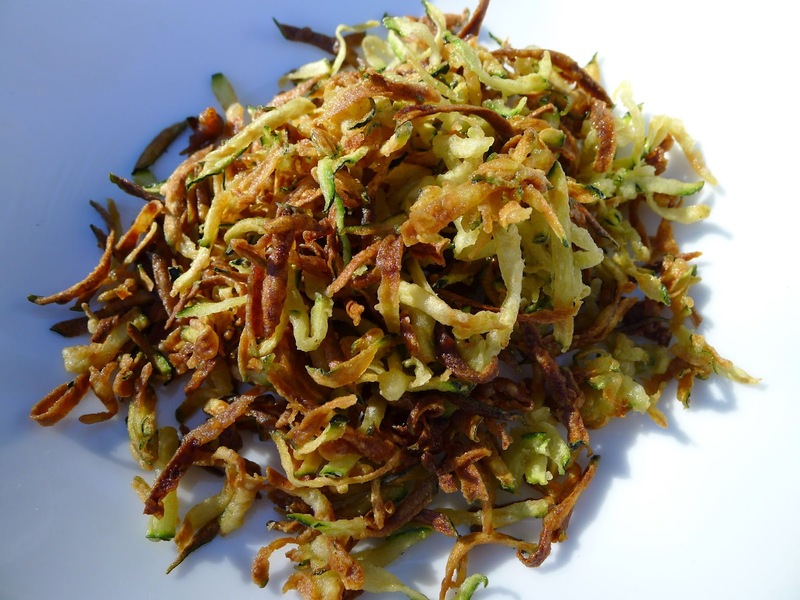 With bread, rice or noodles it easily makes a main dish. The fish vendor, María, was happy to remove the head and spine from the mackerel, but that left the fiddly smaller bones. She suggested giving the fish a turn on the plancha (flat grill pan). Then it would be easier to remove remaining bones and skin and to cut it into chunks to add to the pisto. 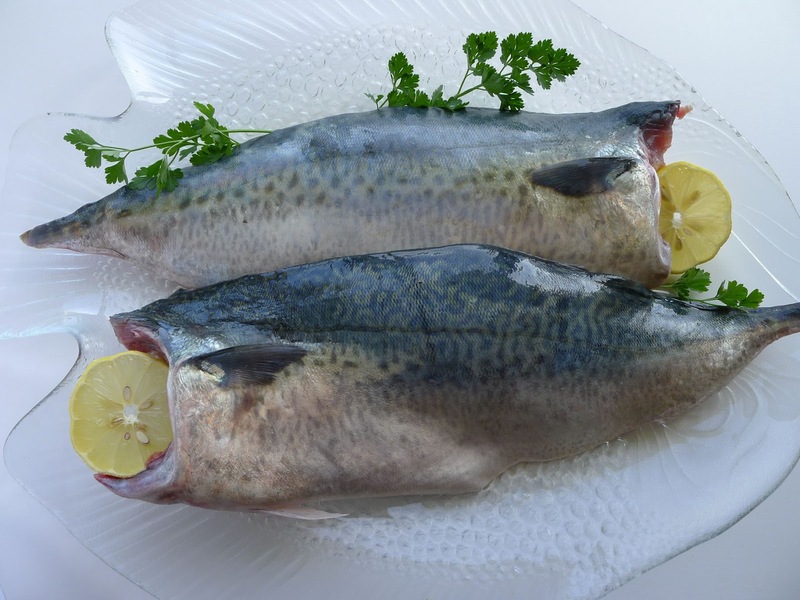 Bluefish fillets are a good substitute for mackerel. 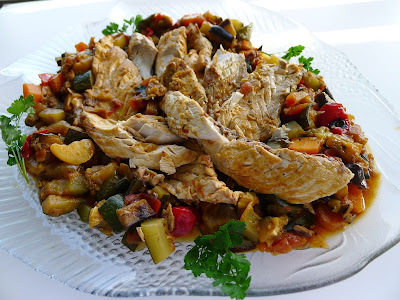 Meaty mackerel with pisto, a melange of summer vegetables. Season fillets with salt and pepper. Brush a flat grill pan/griddle or heavy skillet with oil and heat. Lay the fillets on the grill, flesh side down. When lightly browned, 2 minutes, turn and grill skin-side down for 4 minutes. Remove. Cool slightly. Remove all remaining bones and skin. Cut the fish into large chunks. In a skillet heat the oil and sauté the eggplant, carrot, pepper, garlic and onion, stirring, for about 5 minutes. Add the zucchini, tomatoes, manzanilla, water, bay leaf, sprig parsley, salt and pepper. Cover and simmer until vegetables are tender, about 20 minutes, adding additional water if necessary. The vegetables should be juicy, but not soupy. Add the pieces of mackerel to the vegetables. Cook 5 minutes more. The pisto with fish can be served hot or room temperature. Garnish with parsley or mint. 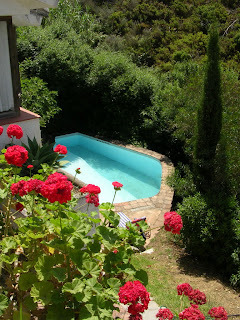 Private pool below the studio. Next to my own house is a “studio,” a guest cottage built when my kids were growing up so that the grandparents would have a place to stay when they visited. Now the boys are grown men, I am renting the studio as a vacation getaway. Most of my guests are Europeans who enjoy one or two-week stays in this tranquil rural location with a completely private swimming pool. A few have asked about cooking classes, so I’ve added that as an option. 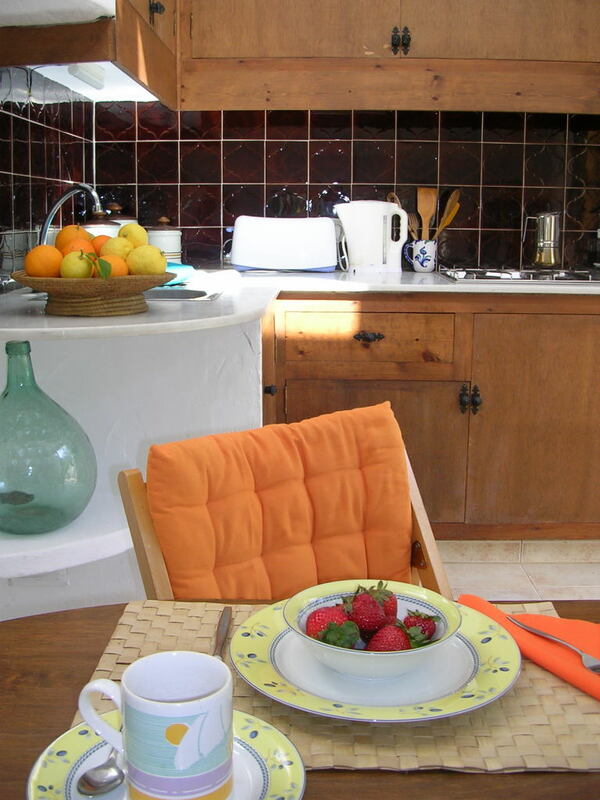 The cooking classes, limited to two persons staying in the studio, can be tailored to you. 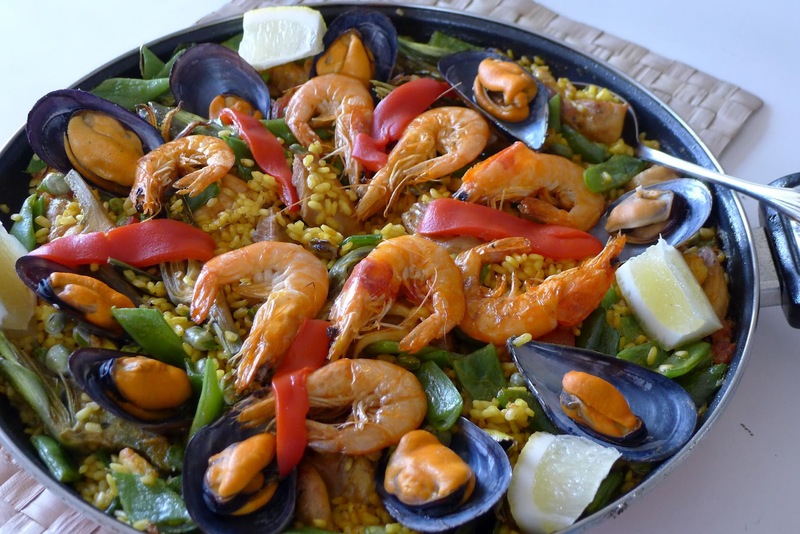 Choose a single paella class—about two convivial hours in the kitchen and as long as you like at table—or a series of classes, such as creating a dinner party or a spread of many different tapa dishes. 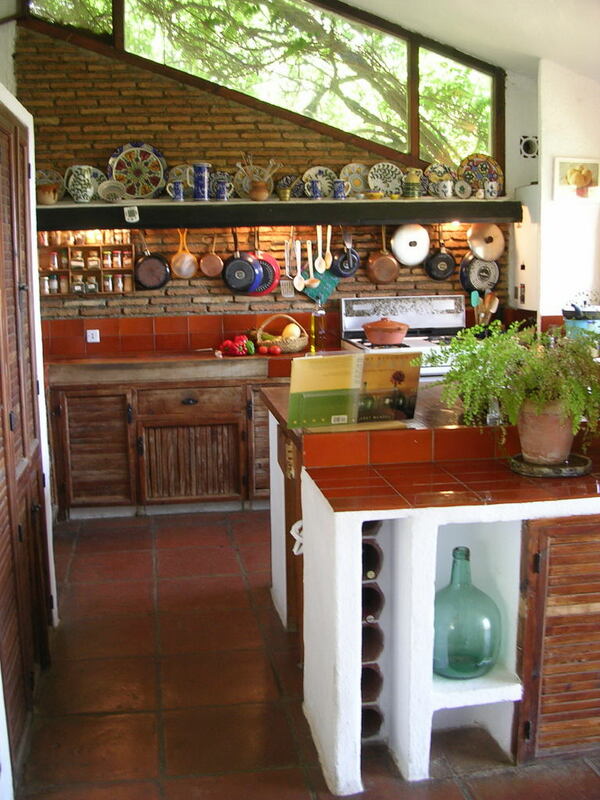 Market tours, wine tasting and other gastronomy visits can be arranged. In the season (December-January), you can help me pick olives and visit a working olive oil mill. Classes are held in my kitchen. If you’ve read the blurb about me (click on my photo at the left to link to my “welcome” page), you know that I’m not a professional chef. 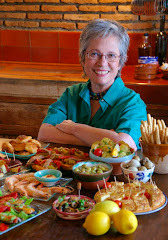 I’m a reporter and cookbook author. 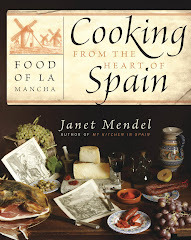 I learned Spanish cooking in tapa bars and village kitchens. 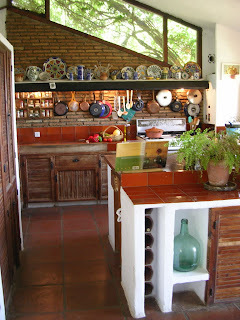 The cooking classes focus on dishes from the traditional kitchen. Guests stay in the studio, but the classes are in my kitchen. Follow this link http://www.spain-holiday.com/rentals/accommodations/properties/15306/Mijas/6/Malaga/0/Andalucia/Mijas.html to see description and photos of the studio as well as the rental prices. Click on “enquiry” to send me an e-mail. 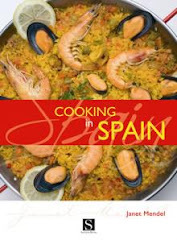 Mention in the enquiry that you are interested in cooking classes. We'll put together the classes that interest you most. Meanwhile, the studio is a perfect home base for exploring Andalusia. Granada, Sevilla and Córdoba are only a few hours drive. March 2013. Trish, one of my guests, blogs about her paella cooking class in my kitchen, with photos of the village market and the paella in the works. Follow this link to read about her experience. “I’m a slave to this apricot tree,” said my friend Charlotte, stirring her umpteenth batch of apricot jam. She has a huge, spreading apricot tree that, in a good year, produces bushels of the sweet-tangy fruit. Most of it drops in heavy winds, sending her into the yard with a basket to gather the windfall. That’s when she calls her friends in desperation to come pick some. I’m happy to relieve her from servitude. 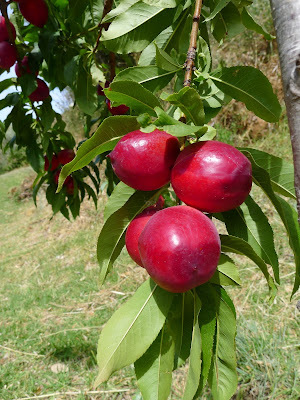 Meanwhile, my infant nectarine tree has a bumper crop this year. Enough of the lovely fruit to eat my fill, but no thought of making jam or desserts. For that I have to visit the local market, where all the luscious summer fruits are at their peak. 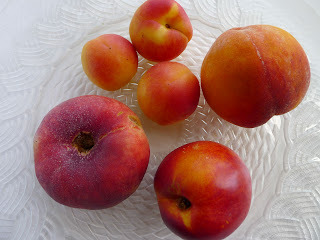 Nectarines (nectarinas); apricots (albaricoques), peaches (melocotones) and plums (ciruelas)—all an inspiration for dessert. Luscious summer stone fruits, clockwise from the top, apricots, peach, nectarine and paraguayo, a variety of peach with a flattened shape. This luscious mousse is an easy, make-ahead dessert for dinner parties. 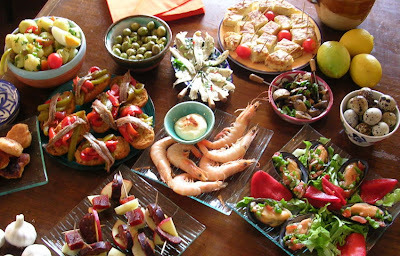 For big buffet parties, where many different dishes are offered, I serve it in small, half-cup portions. As the principal dessert, I offer larger servings. Serve the mousses in the cups in which they are made. You can use small juice glasses or, in a pinch, even plastic cups. The mixture can also be spooned into a baked crumb pie crust or still-frozen as a parfait. 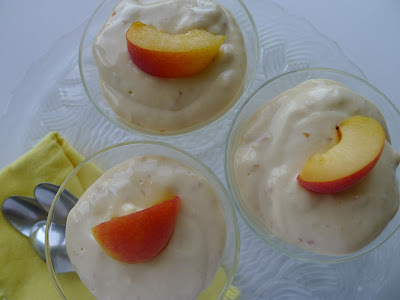 Easy dessert for a dinner party, nectarine mousse. I love my immersion blender. I first puree the fruit in a deep bowl, then blend in the yogurt. Peel the nectarines unless you want flecks of the skin in the mousse. You can prepare the mousse with other fruit in season—apricots, peaches, berries, or mangoes. 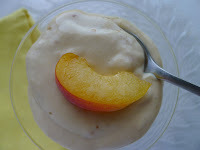 You can vary the flavoring—I like vanilla with nectarines and peaches, almond extract with apricots and grated ginger with mango. 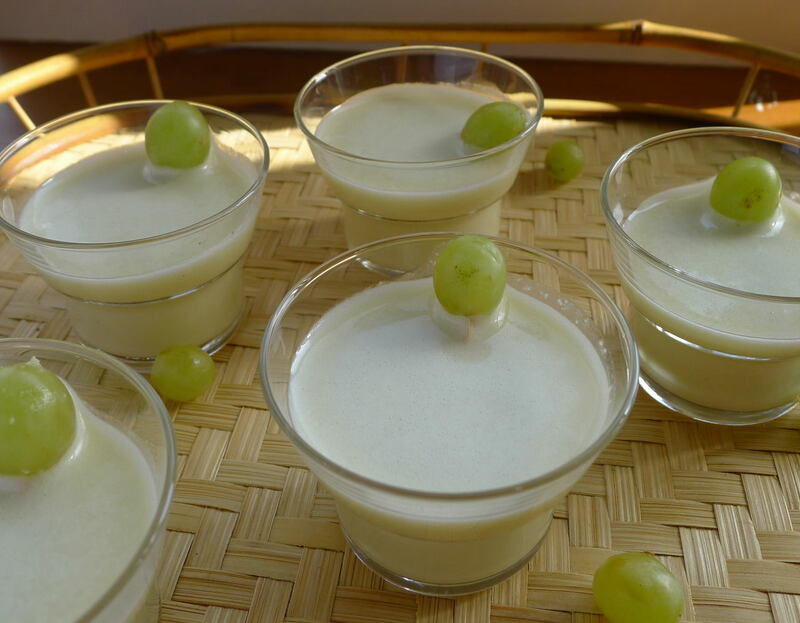 Full-fat Greek yogurt makes a rich, smooth mousse, but low-fat yogurt can be substituted, if desired. The quantity of sugar will vary with the sweetness of the fruit, so taste the mixture after blending. You can use an artificial sweetener if you’re avoiding sugar. You will need to allow space in the refrigerator for the mousses in their individual cups. Garnish the mousse with sliced fruit, a few raspberries for color or a dollop of whipped cream. Stir the gelatin into the water in a small bowl and allow to soften for 5 minutes. Microwave on high for 15 seconds and stir. Microwave 15 seconds more. Stir to dissolve the gelatin. Peel and slice the nectarines. Puree the fruit in a blender (makes about 2 cups puree). Blend in the lemon juice, sugar, vanilla, and yogurt. Blend in the dissolved gelatin. Set 10 small glasses or 6 dessert coupes on a shallow tray. Divide the mousse mixture between them. Refrigerate (or freeze) at least 4 hours and up to 2 days.